Salmon, Maureen (2017) Emotional Intelligence + Academic Performance + Design Thinking. In: the International Congress on Emotional Intelligence (6th ICEI), 19-22 July 2017, Faculty of Psychology and Education Sciences – University of Porto, Portugal. he insights were based on qualitative interpretative data from a range of sources include students’ interpretative analysis of their Trait Emotional Intelligence reports, reflective writings to evidence the impact of emotional intelligence on their well-being, academic performance and employability potential. As as tutor and and emotional intelligence practitioner, the author explored emotional intelligence learning within curriculum development, teaching and learning pedagogy, the University’s ‘Creative Attributes Framework’ to improve students’ academic performance and employability. The findings will inform how the course curriculum and evaluation system are redesigned to include emotional intelligence as a key aptitude for developing design leaders, managers and strategist in changing global world. Seal et al (2010) advocates that it is not enough to produce the brightest and the best technically minded experts. Universities must seek to develop the whole person, better prepare graduates for future success. Students who are able to develop their capacity to understand themselves, the world, build meaningful relationships and foster positive change have the advantage in education, work and life. 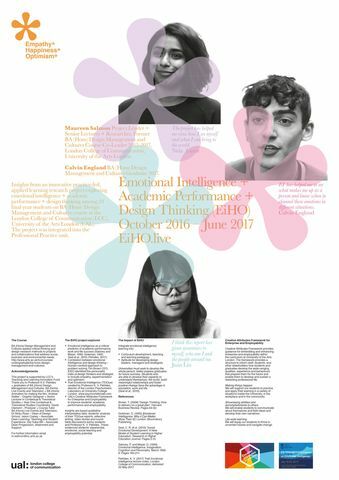 The poster was a co-presentation by the author and recent graduate of the BA Design Management and Cultures course, Calvin England. The main aim of the 6th International Congress on Emotional Intelligence (ICEI) Porto 2017 was to promote research in the field of Emotional Intelligence (EI), bringing together leading researchers and scholars from around the world to collaborate, exchange and share theoretical and empirical research findings and innovative applications of EI. –	pre-conference workshops for researchers and practitioners.